understand the views and feelings surrounding the use of guns and rifles in today society. It must be stressed that our .177 and .22 air rifles are used under the strict supervision of our experienced and qualified members of staff. we believe that a little knowledge is better than a lot of ignorance. If individuals are shown the dangers of handling air rifles and taught the correct way to handle guns, rifle shooting becomes a safe and enjoyable sports activity. Sessions start with a thorough safety brief, looking at parts of the gun and its correct use. After the safety, individuals are asked to step forward for practice shots at field targets. After initial practice shots and aim improvement participants take part in a number of shooting games and the inevitable "FUN" competition. 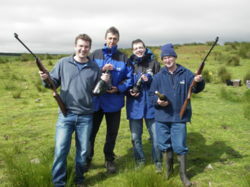 To view some of our air rifle shooting pictures please click here rifle shooting images.